We would like to thank Jodi for loaning us her SUV while our car was out of commission for two months. We could not have continued to function without the use of her car. We put an extraordinary number of miles on a vehicle transporting dogs to adoption events, vet care, home visits, etc. THANK YOU JODI. Cry For Help Rescue is working with River Valley Animal Rescue (An all volunteer shelter) in Momence. The new shelter is located at: 3960 N. Vincennes Trail Momence, IL (815-507-5007). Please come and see all of the wonderful animals being cared for at the shelter. There is also a room dedicated for seniors and dogs with special needs. They are not in crates but have couches and beds to lay on with a large screen TV. They also have the company of other dogs. This is a vision of Fran's, the founder of River Valley Animal Rescue, to have a place where they can live out their lives if they cannot be adopted. Please come and see all of the wonderful animals looking for forever homes. There are puppies, adult dogs, cats and kittens, birds and rabbits. CRY FOR HELP IS IN DIRE NEED OF FOSTERS. IF YOU CAN HELP, PLEASE EMAIL JEAN LAZZARO AT CRYFORHELPRESCUE@GMAIL.COM. THANKS FOR ANY HELP YOU CAN GIVE. Brooke's family adopted Tony last year, he's an adorable Cairn Terrier. 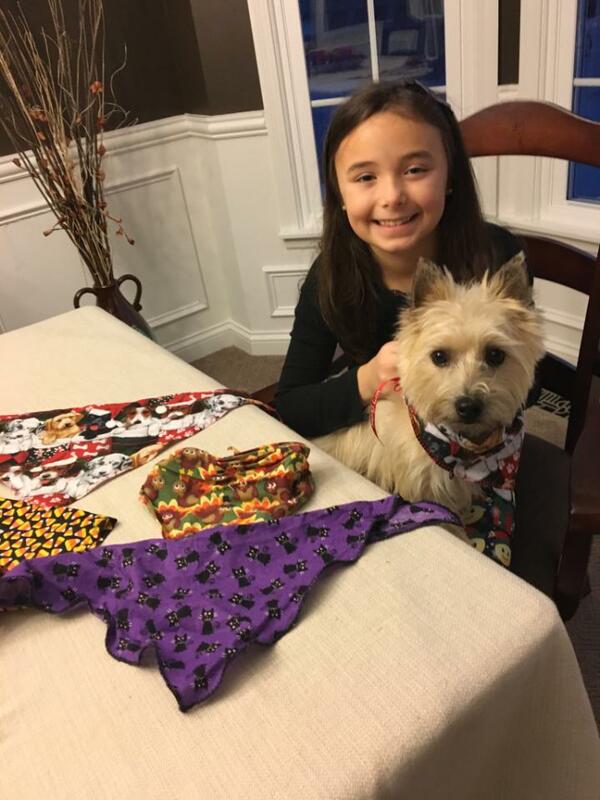 Brooke has been sewing and selling holiday themed doggie bandannas. Brooke has made Halloween, Thanksgiving and Christmas bandannas so far, she plans on doing Easter and Valentine themed bandannas next. She has surprised our rescue by donating the proceeds to Cry for Help Rescue. Brooke has raised $115 for the rescue. Any breed of dog can be vicious. Unfortunately Pit Bulls get a bad rap because the media sensationalizes the breed. We work with all breeds and have come to know never to generalize a breed. 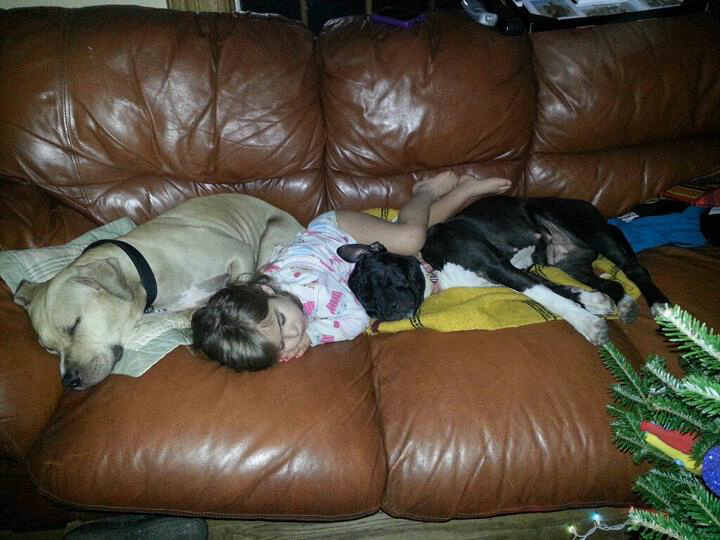 One of our adopters sent us this photo which speaks volumes. Please do not discriminate or put all Pit Bulls in one category. Just like people, some good/some bad. Please see our Wish List section for story on Padraig and his birthday party invitation. I would like to thank all of our wonderful volunteers (Fosters, volunteers at our adoption events, coordinators helping with fundraising, our facebook and email control, to all the wonderful supporters who have contributed monetarily to our special needs animals). We are so grateful for the help and support we receive to help the animals that really need our help. Thank you from the bottom of my heart. We could not continue to function without your support. I would like to thank our adopters who have chosen adoption over purchasing a companion. Why Adopt from Cry For Help Rescue? Adopt from Cry For Help Rescue and make a difference in the life of a homeless pet. All our adoptable pets are rescued from high-kill animal control organizations, humane societies, and owner give-up situations within Illinois and Indiana. For every pet we adopt, we can save another life. Before you adopt from any shelter or rescue group, please read our tips for successfully adopting a rescue dog at our page https://acryforhelprescue.webs.com/planahead.htm. 5. You're doing a good thing - your new pet needs a great home like yours! Read about Cry For Help Rescue in the news! This article is about one of our adopted dogs who is now a therapy dog! Social media is a great way for us to connect and spread the word about our adoptable animals and rescue needs. An easy way to help us is by connecting with Cry For Help Rescue on your favorite social media sites, and then sharing with your friends! Be a Cry For Help Insider...follow us today and spread the word!